Check Out One Million Lights’ Latest Good Deeds! Read their most recent newsletter! 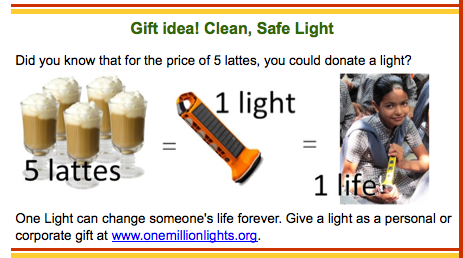 I LOVE One Million Lights‘ work and affordable giving that makes a real, immediate difference, so, I love the idea below! One Million Lights is a fantastic choice for your charitable dollar. The rippling returns on your investment are quite literally, immeasurable. So Give the Gift of Light!